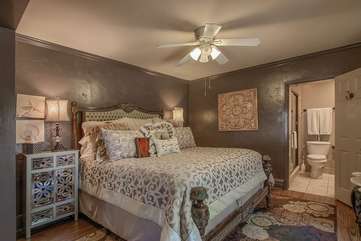 This boutique historic Inn is located a half block from Main St in the heart of downtown Fredericksburg convenient to shopping, restaurants, art galleries and festivals. Whether you rent the six suites by themselves or together for a group of twelve, they all offer a large amount of privacy for only being one block from Main Street with your own private parking. HOSTS - All suites are private. No host on site. AMENITIES - All suites have standard cable TV, WIFI, & off street parking. Common areas include a full kitchen, dining area, large shared hot tub, firepit, plenty of outdoor seating, and front porch rockers. Seventh Heaven has a fireplace.